Strabismus, more commonly known as squint or cross-eyed, is a vision condition in which a person cannot align both eyes simultaneously under normal conditions. One or both of the eyes may turn inward, outward, upward or downward. An eye turn may be constant (when the eye turns all of the time), intermittent (turning only some of the time) or can alternate between both eyes. It is estimated that up to 5 percent1 of all children have some type or degree of strabismus. Children with strabismus may initially have double vision and poor depth perception later. This occurs because of the misalignment of the two eyes in relation to each other. In an attempt to avoid double vision, the brain will eventually disregard the image of one eye (called suppression). Untreated eye turning can lead to permanently reduced vision in one eye and this condition is called amblyopia or lazy eye. Some babies' eyes may appear to be misaligned, but they are actually both focusing on the same object. 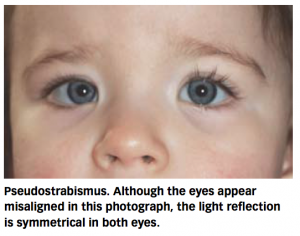 This is a condition called pseudostrabismus or false strabismus. The appearance of crossed eyes may be due to extra skin that covers the inner corner of the eyes or a wider and flatter bridge of the nose. Usually, the appearance of crossed eyes will go away as the baby's face begins to grow. 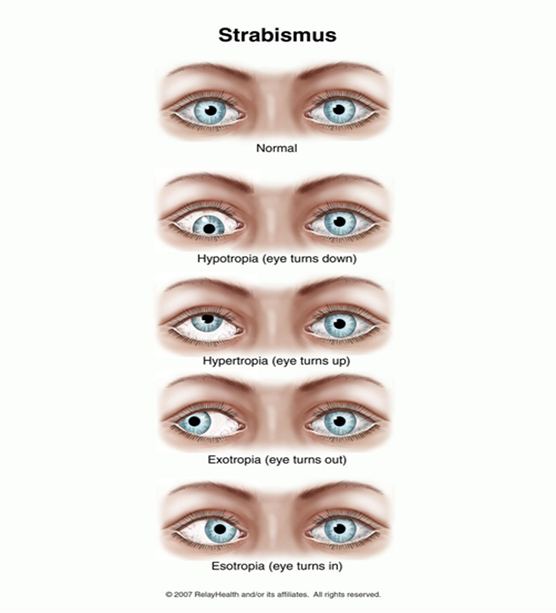 Strabismus usually develops in infants and young children often by age 3. However, older children and adults can also develop the condition due to other underlying conditions. People often believe that a child with strabismus will outgrow the condition. This, however, is not true. Strabismus in children does not go away on its own and strabismus in adults is treatable, therefore treatment is necessary. Treatment for strabismus may include eyeglasses, prisms, vision therapy or eye muscle surgery. If detected and treated early, strabismus can often be corrected with excellent results. In actual fact, strabismus may get worse without any treatment. Any child older than 4 months whose eyes do not appear to be straight all the time or when parents are in doubt, should always be brought for an examination by an optometrist.